The truth is… if you don’t want to buy a special product to clean your Jeep soft top and vinyl windows, then your safest option is to simply use a mild dishwashing detergent and warm water. Regular ‘ol soap and water will keep dirt from building up in your Jeep’s zippers as well. That said, your best option is to actually buy a specialty product that was designed specifically to clean and protect your soft top and vinyl or plastic windows. Personally, from the day that we’ve owned our 2004 Jeep Wrangler Unlimited (which was only owned for a few months by someone else), we have used products that are specifically designed for the cleaning and protection of Jeep soft tops and windows. As a result, our soft top is still in excellent condition. It’s unavoidable… if you let dirt and grime build up on your Jeep’s soft top and vinyl windows, it will ultimately lessen the life of your soft top. Time and the sun’s harmful rays will take their tole on your Jeep’s soft top over time. So why accelerate the process by adding dirt and grime to the mix? Generally speaking, you should try to avoid parking under trees. That is, unless you like to clean your soft top more often than usual. For older Jeep windows with serious scratches, fading, fogging, or stains try using Mopar Jeep Cleaners by Chrysler. You want to avoid window cleaners and products with ammonia or alcohol in them like Windex, Formula 409, Fantastik, etc. These tend to dry out plastic and will eventually lead to cracking and discoloration. While you’ll hear a number of people recommending Pledge spray polish (regular, not lemon) on Jeep windows, it’s in your best interest to avoid it. Over time, it will cause your Jeep’s windows to turn yellow. I haven’t tried this, but supposedly the Jeep Window & Plastic Restoration Kit is good at removing haze and cloudy patches in vinyl convertible windows. Mothers Plastic Polish also works well on a Jeep’s vinyl windows, as indicated by these reviews. I’m told the Novus Plastic Cleaner & Polish is good at removing scratches from a convertible’s vinyl windows before they get too bad. 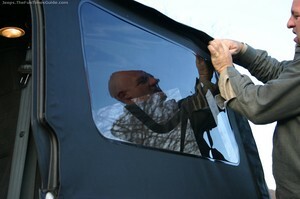 Plexus Plastic Cleaners work very well on a Jeep’s soft top windows… and more. It seals the pores in plastic surfaces with a micro-thin layer of protective wax. That way, the plastic becomes resistant to dirt, debris, oil, and scratches. You can also use Plexus on your Jeep’s bumpers and headlamps. For what it’s worth, I know of a Jeep Wrangler owner who used to get all of their cleaning products and had all their soft top & window repairs done at a Marine shop. One time, the Jeep dealer quoted $12,00 to replace the Jeep’s vinyl windows. Instead, the Marine shop replaced them for $150! While I’m not crazy about their recommendation to use Pledge on vinyl windows (see above), I like how these Sailors tend to think outside-the-box when it comes to creative uses for everyday products! Many of their practical ideas would apply to the use and care of a number of different items around the house — not just your Jeep’s vinyl windows. You definitely want to avoid car washes, because the high-pressure sprays and rotating brushes will force water into the vehicle. Taking your Jeep soft top through an automatic car wash will scratch the Jeep’s windows and might even tear the seams. Plus, some of the chemicals can cause irreversible damage to the vinyl itself. And finally, while the super-powerful vacuum cleaners at car washes are pretty good for keeping the interior of your Jeep clean, you can’t beat the convenience of a portable car vacuum cleaner. They’re pretty darn powerful these days! Here’s something that we’ve learned from experience: it’s just a fact of life that rolling up the Jeep’s back window will fog the window itself by introducing lots of very tiny, fine scratches as the vehicle moves. This is true even if the window has recently been cleaned. To avoid having to roll up the back window, one Jeep owner installed 2 grommets in the bottom of the material under the back window (one in each corner), and he uses bungie cords to attach the rear panel to the roll bar whenever he wants to open it. Another idea, if you’re actually going to roll up the rear window, is to place a clean towel, a soft cloth, or pages of a newspaper against the plastic window, then roll the window with the towel, cloth, or newspaper inside the roll. This keeps the window’s surfaces from rubbing and getting scratched whenever the vehicle moves. We use the Clover Patch Jeep Window Cover & Roll Up Bag to protect our vinyl Jeep windows from scratches when they’re not on the Jeep. A word of advice: If you go on vacation to the beach and leave your Jeep windows rolled up, whenever you roll them back down, you will not be able to see through them! The blowing sand and rubbing action while the vehicle is moving is like taking a sheet of sandpaper to your Jeep’s windows. Speaking of the beach… you don’t want to handle your Jeep’s vinyl windows when you happen to have sunscreen on your hands. It will turn the windows cloudy. And finally, a winter tip: Never try to roll up your Jeep’s vinyl windows (or even loosen them) while frozen in the winter. They will shatter like real glass! What About Those Jeep Zippers? If they don’t open or close smoothly and easily, you might try lubricating the Jeep zippers with a spray lubricant that’s suitable for vinyl zippers. Keep in mind, spray lubricants typically cause dirt and grime to collects in the zipper, defeating your purpose. Some Jeep owners carry a small bar of soap in the glove box. By rubbing the bar of soap directly onto the zipper itself, it will lubricate the zipper without attracting as much dirt & grime as the spray lubricants do. If you can’t easily grasp the tiny zipper pulls around your Jeep’s windows, attach a keyring to the zipper tab. As long as it’s large enough for you to fit your finger through, you’ll be able to work the zipper much easier now.